I love award show season…LOVE IT! I watch the Pre-shows, the red carpets, the awards shows themselves, I cry, laugh, eye-roll and yell at the TV (in the same way men do during football season) at the acceptance speeches and winner disclosures and I absolutely watch the fashion wrap-ups. Now it’s not every esoteric one. I limit it to the Golden Globes, The SAG Awards, The Grammys, The Emmys, The Oscars and, of course, The Tonys. The Grande Dame of all of these–I actually have two but Grande Dames but not everyone agrees with me, major props if you can guess my #2–is The Oscars. I’ve never done an Oscar viewing party, but I’ve always wanted to and I have TONS of ideas. I’m thinking that this might be the year. Here’s the thing… We always watch it, we never have the kids Sunday night (they go to their fathers’ house on Sunday night), I really love having gatherings around things I love and I have a number of Oscar loving friends. Why the heck not? Here are the things I’m thinking about doing should I ever have an award show party. I love paper invites, but who has the time unless its a wedding or something really huge? I’m an Evite girl, and this year, they really upped the ante with these great looking Evites for all different themes to get you started. I like to stick with two colors–in this case gold and likely black. I know a lot of people suggest a red carpet for an award-show party, but I think it can look cheesy. I like clear vases filled with gold decorative balls or beads or go with yellow roses. Scatter star confetti around your table and use black or gold table cloths. Alternate your napkins and plate color (assuming its paper–see flute exception) to contrast with the tablecloth. Start the party early, and pre-make Oscar ballots for guests to fill out. Here is a free fancy downloadable one from Glitter and Ganache and here is another free one that is more straight forward from Moviefone. Fold them up into gold envelopes (50 for $15.71, Paper-Papers.com shown) or tie them up with gold ribbon (15 yards for $5, Amazon). You’ll need to provide writing instruments for guests to fill out their ballots before the show starts. At the end of the night, the guest who has the most winning picks can win a prize–perhaps a DVD of an Academy Award nominated film, an iTunes gift card to add more media to their library or a book about Oscar trivia or history. During commercials, find a way to keep the party going with a fun game–no I’m not going to suggest movie charades…way too laborious for a party about a televised event. I went to a Superbowl party recently where we played “flash rounds” of Cards Against Humanity (List Price $49.95, Amazon shown) which was perfect. Now full-disclosure, this game is not for the faint of heart, and you must know your group well…this game is filthy. Other less controversial options are Apples to Apples (List Price $26.99, Amazon) or Taboo (List Price $31.99, Amazon). But oh-so fun. Want to try to mix-up some cocktails named after Oscar nominees? Gourmet.com has a whole bunch, check them out. For a menu you want to enjoy your guests, watch the award show and still be glamorous but not break the bank…right? I’m a fan of filling apps, but if you’re going to be starting early and going through to 11pm, you’re going to need to heavy up on everything. Get lots of cheeses, meats for a charcuterie platter, olives and mixed nuts. With cheese, I like to get a mix of hard and soft and get a big hunk of Brie along with a Pillsbury Crescent Roll dough. I separate the dough into 2 pieces and cut the cheese wedge in half wrapping one wedge in one piece of dough and bake it in the toaster oven until it is golden brown. If you want to be creative, you can add dried cranberries or other yummy stuff inside the dough before baking. I serve it with Carr’s water crackers and apple slices. It’s delicious and looks very laborious. It’s not. 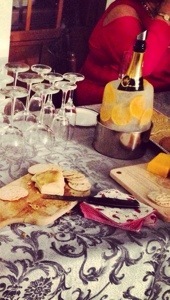 You can get a slight glimpse of it in my Proseco area photo–it’s on the cutting board. Another yummy appetizer: lightly spread cream cheese and smoked salmon draped over pumpernickel triangles. Low maintenance, yummy, thematic and indulgent. 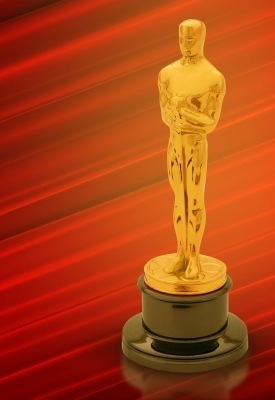 Want to check out menus themed around this years Oscar nominated films like Argo, Lincoln and Beasts of the Southern Wild? Check out Epicurious.com. Oh and my #2 Grande Dame is… cue music… The Tonys. Hands down.